Dr Brian Burns passed away on Friday 27 July 2018 in Rockhampton, after a six-year battle with prostate cancer. He was 63. Brian was a Principal Research Scientist with the Department of Agriculture and Fisheries, specialising in beef cattle husbandry and genetics research, development and extension. After completing his Veterinary Science degree at the University of Queensland in 1977, Brian began working for the Queensland Department of Primary Industries as a Meat Inspector in 1978 with the national Brucellosis and Tuberculosis Eradication Campaign. He then spent several years in private veterinary practice in Merriwa, New South Wales and Longreach and Mt Isa in western Queensland. He returned to the Department in a beef cattle husbandry research role in May 1983 based at the Brigalow Research Station near Theodore. He also held positions at Swans Lagoon Research Station at Millaroo, Richmond and Rockhampton. While employed by the Department, he completed his Masters at James Cook University in 1990 and his PhD at Texas A&M University in the United States in 1995. From 2010 to 2015 he was a Senior Research Fellow at the University of Queensland, returning to the Department in late 2015. He also lectured in the School of Veterinary Science at both the University of Queensland and James Cook University, and supervised several Masters and PhD students. Brian was a passionate veterinary scientist with lifelong focus on improving beef cattle production across northern Australia. He was well connected, with extensive producer networks that have proved invaluable in fostering industry collaboration, vital for effective research projects. 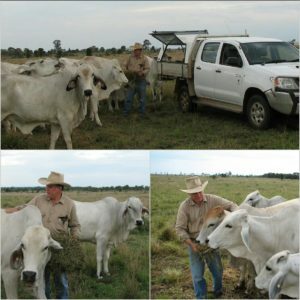 Brian’s rapport and reputation with beef cattle producers and the Tropical Breed Societies was also valuable in implementing BREEDPLAN across northern Australia. BREEDPLAN is the most advanced system of genetic evaluation in the world. In 1999 Brian was awarded a Churchill Fellowship and travelled overseas to examine genetic improvement and optimisation of breeding programs to meet target market specifications. In 2016 his service to the beef industry was recognised with the North Australia Beef Research Council Medal for outstanding Scientist. Throughout his career, Brian was consistently supportive of his colleagues within the Department, and in other research organisations, He recognised the value of collaboration and the need to pool skills and resources for practical, industry-relevant research. He published extensively in scientific literature with over 100 publications, 43 of them as senior author. He also wrote many articles for beef cattle producers, extension officers and consultants. Throughout his illness, Brian remained in close contact with producers and colleagues, and was determined to return to the work and the industry, and the people he loved. A recent highlight was his role in the field tour to Steve and Claire Farmer’s Mt Elsa property north of Rockhampton during Beef 2018 in May. Even in his final days, he was active in discussing ideas on how to advance the cattle industry in northern Australia. Most phone calls or conversations with Brian would be peppered with him saying “and just one more thing…”. We can all take strength from the positive way Brian approached his challenge with cancer, and the long journey it became for him and his family. Brian’s funeral service, held at St Joseph’s cathedral in Rockhampton on Wednesday 1 August, was well attended by family, friends, beef producers, research colleagues, and many current and past departmental staff. While Brian will be sadly missed, his research results live on in his published work, the genetic evaluation tools in use today. He will be remembered for his ethos and passion for hard work, collaboration, and never giving up. Dr Brian Burns, at Brigalow Research Station, with trial cattle used to examine the epigenetic influences affecting the productivity of Bos indicus-Bos taurus crossbred beef cattle, November 2008.